I promised lots of news for the month of March and trust me, this is just the beginning! I always seem to have so much to say! 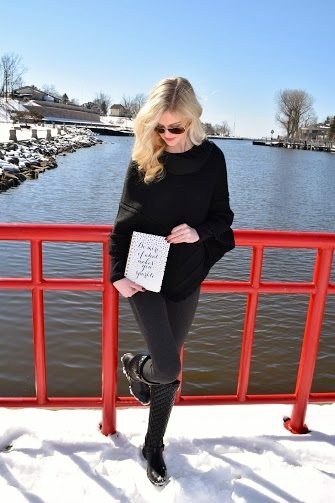 I am especially excited to share this post because not many people know why I actually started my blog. 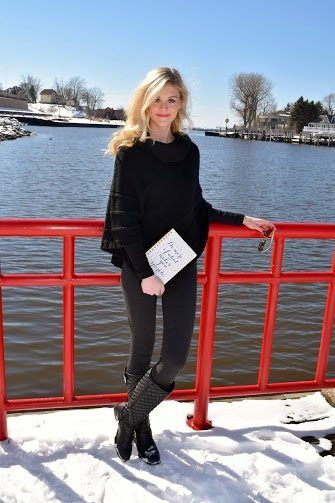 While I do love fashion and showing off fun locations, such as South Haven in the pictures above, the blog was really the start of a new beginning for me. 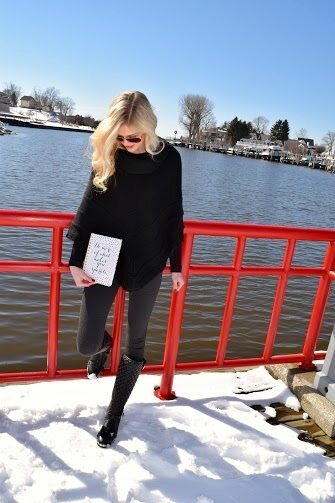 I always think of the quote that frequently pops up on my Pintrest feed, “You can’t start a new chapter of your life if you keep re-reading the last one.” I think that’s why as my blog approaches one year, I am in awe of where it has come but also where I have come in my personal journey. Last year, I went through some things in my personal life that caused me to really struggle emotionally. This went on for quite a few months when finally, around this exact time last year I pulled myself up by my bootstraps and decided that I could either sit and wallow forever or I could choose happiness. I chose happiness. I decided that it was finally time to move onto the next chapter. Through my blog, I was able to focus on myself and pursue my passions. It got me out, it kept me busy and most importantly, it made me very happy. My blog has connected me to so many people and opened the doors to so many opportunities. For that I am very grateful. The journal I am holding in the pictures above was given to me by my dear friend, Denni, for my birthday. 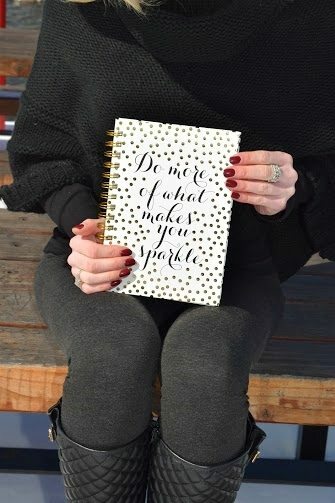 The message couldn’t be more perfect as it reads Do More of What Makes You Sparkle. My blog gives me the opportunity to do just that and I absolutely love it. Find something that makes you sparkle and give it your all! While it’s not the answer to all of your problems, it’s certainly a step in the right direction. I want to proceed with caution as I keep writing because I don’t want my message to be misunderstood. This all is not to say that once I chose happiness and started writing my blog everything turned from bad to good. I wish it was that easy! I struggled for quite a while and quite honestly, I still do! Sometimes life throws a little more at us than we can handle. Not only that but mental health plays a big role. It is so important and should not be pushed to the side or overlooked. With the right tools, and the right support, everything will work out if you’re willing to speak out. It’s important to remember that you’re not alone in this walk through life and everyone experiences ups and downs. Social media can often times make us feel inadequate and I am guilty of contributing to that. If you scroll through my Instagram feed, you would never guess that I’ve gone through some stuff that has been incredibly hard for me to overcome. Some of which I am going through right now. Everyone is sharing their best moments and their best pictures. You don’t see too many people posting about a terrible day or a terrible week or even a terrible month. It’s important to remember that no one is perfect. Everyone’s got something including myself. As you read my blog, I hope you keep in mind that 90% of the pictures I take are hilariously hideous and awkward and I pick the 10% that turned out well! I hope you can remember that I too am human and I struggle. And I hope you can remember that this blog is special to me as it is symbolic of where I’ve come, what I’ve walked through and where I’m going. I share this all because like I mentioned earlier, mental health is so important. It’s a fairly new discovery for me and I think it’s worth speaking out about. I think it’s important to support each other through good times and bad and if my story can help just one other person, then it will be worth sharing. My next post will have a big emphasis on the message, “it’s ok to NOT be ok”. Thanks for reading! I am so very proud of you. Don said you write very well.